For us, light is an extraordinary phenomenon that illuminates our world and makes it visible. What would we do without it? Since we first opened our eyes, humans have worshipped the Sun as a god of light and a source of life and security. The emergence of rational thought brought with it a need to question the nature of this phenomenon. So what exactly is light? Light is a form of energy produced by matter. To understand how light is created, we must first take a look at atoms, the building blocks of matter. An atom somewhat resembles a beehive with a swarm of bees buzzing around it. The beehive represents the nucleus of the atom and the bee swarm represents the clouds of electrons that circle the nucleus. An atom’s nucleus and electrons share the distinctive property of being electrically charged, but with opposite charges: the nucleus has what is known as a “positive” charge whereas electrons have “negative” charges. In the world of atomic particles, the adage holds true that opposites attract and thus the nucleus and electrons are mutually attracted to each other within the atom. There is an important difference between bees and electrons: bees can fly wherever they want around a beehive but electrons cannot roam freely around the nucleus of an atom. 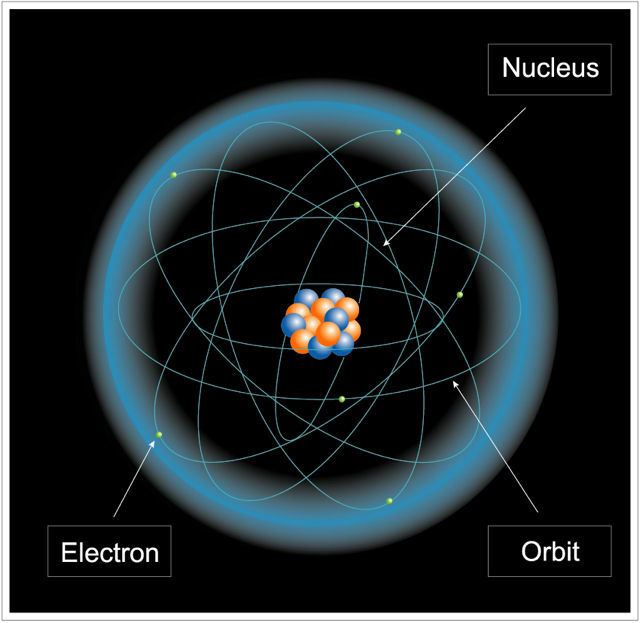 In fact, despite their electrical attraction to the nucleus, electrons are restricted to specific orbits (scientists call them “orbitals”) that lie at fixed distances from the centre of the atom. Although an electron cannot randomly occupy positions within an atom, it can nonetheless change its distance from the nucleus by changing its energy level. To do this, its energy content must be modified to match the energy level of the new orbit that it will enter. For example, to move from a distant orbit into a closer orbit, the electron must eliminate some of its energy. The energy released is partly electrical in nature and – as with all negatively charged bodies – partly magnetic. This excess energy is released by the electron in the form of an energy packet known as a “photon”. A photon is an energy particle that has no mass and moves at high speed. When a moving photon interacts with matter, it does so as a wave, like a wave moving across the surface of water. These waves are known as “electromagnetic waves” because they display both electrical and magnetic components. In a manner of speaking, photons and electromagnetic waves are synonyms, and in everyday terms they are simply referred to as “light”. In fact, a photon can be thought of as a “particle of light” and an electromagnetic wave as a “lightwave”. Light is about seeing things. When I see you, it's because there is light. I cannot see light itself, but thanks to the light you emit, I can see you. If we discuss light in physics terms, we have known since Maxwell's time that light is a wave, an electromagnetic wave. In other words, light represents variations in a magnetic field. To this, quantum physics has added the notion of a photon: light is also particles, tiny particles that leave a source and move towards you. The question of how light can be both a wave and particles at the same time is answered by quantum physics, but I won't give you the answer right now because we would be here for a very long time! What we usually tell people (and I quite like this way of putting it) is that light behaves as particles when you're looking at it, and as a wave when you're not!